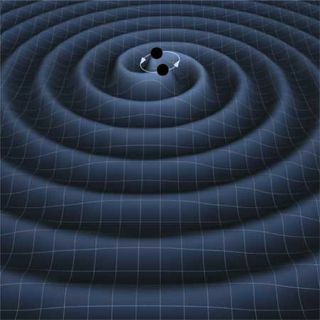 An artist's impression of two black holes circling each other, creating gravitational waves. Scientists think many such pairs exist, and together they create a gravitational wave background. Pairs of black holes circling around each other, getting closer and closer to crashing together, may create ripples in space and time — but new research suggests that these ripples are milder than previously thought. A new paper searching for signs of these space-time ripples — known as gravitational waves — came up empty, suggesting that theorists need to rethink their models of these monster pairs. The new work affects searches for gravitational waves using pulsars — dead stars that appear to create regular pulses of light, not unlike a lighthouse. Sometimes looking for objects in the universe is like looking for boats on the ocean at night. Sitting on the shore under the stars, it can be easy to see a boat with a spotlight, or red warning lights. But what about a boat that has no lights, or is hidden by a rocky outcropping? These invisible boats leave behind another bit of evidence as they pass by: The waves they make in the water. Even in the dark, someone sitting on the shore can hear or feel a sudden surge in the size of the waves, which signals the passing of a vessel. In this same way, scientists want to detect the dark and hidden black holes that lurk throughout the universe by looking for the waves they create in space and time. It was Einstein who said that space and time are not two independent features of the universe, but are woven together into a single fabric. Strong gravitational forces, like two black holes spiraling toward each other, can create gravitational waves in this fabric. Vikram Ravi is a postdoctoral fellow at the California Institute of Technology. He's also part of the Parkes Pulsar Timing Array, which was established to search for gravitational waves through an indirect method — the way they interrupt the light from pulsars. Pulsars are dense remnants left behind after a star explodes into a supernova. Pulsars emit beama of light out into space in two opposite directions — just like some lighthouses. Pulsars also spin — like some lighthouses — which means from Earth, these pulsars often look as though their light is pulsing on and off. It turns out these compact little flashlights "pulse" with incredible regularity, so much so that they're used as cosmic clocks. Scientists with the Parkes Pulsar Timing Array want to look for interruptions in the regular pulse of these pulsars caused by gravitational waves. Put simply, if a gravitational wave passed by a pulsar, it could warp the space-time between the pulsar and Earth. This could cause a hiccup in the timing of the otherwise extremely regular light pulses. If there were only a few sources of gravitational waves in the universe, it might be easy to detect a single such blip in the light from a pulsar. But according to Ravi, scientists think there are many sources of gravitational waves all over the universe. These come together to create a constant, noisy rippling in the space-time fabric. To visualize this, consider a pond that it totally still on its surface. A single pebble dropped into the pond will cause ripples that can easily be traced back to the source. But during a rainstorm, many droplets of water disturb the pond's surface and create a minimum amount of rippling across the entire surface. According to Ravi, a large contributor to this background would be black hole pairs orbiting each other, slowly winding down until they eventually merge together into one. Since most galaxies are thought to have black holes at their centers, this kind of black hole binary would likely occur whenever two galaxies merged together. "Galaxies in the universe today we think formed from the mergers of smaller galaxies. And that's […] what we see – we see plenty of galaxy mergers," Ravi said. He added that this also fits with current theories about the evolution of the universe. "So because we think that mergers between galaxies occur all over the universe, we think that there should be many of the orbiting binary black holes. And so the gravitational waves emitted by all of them, in principle, should form a background." Ravi and colleagues studied a group of pulsars for 11 years, eventually focusing on four of them, looking for the background gravitational wave signal. Theoretical work has suggested that the CSIRO Parkes radio telescope observatory in Australia should be sensitive enough to detect this background. Ravi said he and his colleagues reached that level of sensitivity, "but there's no signal." Meaning, if it does exist, it is quieter than what the theories predicted it should be. "So what it means is that the theorists — including me — need to come up with better models," Ravi said. "They need to think a bit harder about what the gravitational wave signal may actually look like." Parkes is not the only program searching for these gravitational wave hiccups in pulsars. Together, these programs collaborate as part of the International Pulsar Timing Array, and by combining data, these programs may have a better chance of finding a gravitational wave signal. Chung-Pei Ma, a professor of astronomy at the University of California at Berkeley, who was not involved with the new research, said the work "presents the tightest yet limit on gravitational waves from merging binary black holes. This limit is now stringent enough to start constraining some models for how galaxies and black holes were assembled over the cosmic history. There is still wiggle room left for the theorists and model builders, but the air is getting a bit thinner and everyone has to work a bit harder to explain this new upper limit." While the researchers are hoping to find a positive gravitational wave signal soon, there is plenty of work to be done in preparation for that discovery. "It's exciting that we're able to actually to say something meaningful about the universe using gravitational waves," Ravi said. The new work was led by Ryan Shannon at the Commonwealth Scientific and Industrial Research Organization (CSIRO) in Australia, and appeared in today's (Sept. 24) online issue of the journal Science. Ravi completed the research while working at the Swinburne University of Technology in Australia.